Flowers white; XI/XII-III/IV; corolla urceolate, to 5.3mm long; width at lobes 2.0mm, at widest 2.9mm; calyx white; foliage green; habit low shrub; height 15cm; spread 30cm after 2 years. 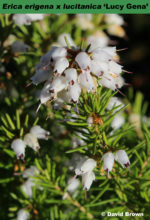 Deliberately created hybrid with Erica lusitanica 'George Hunt' pollinated by an unnamed Erica erigena seedling (from 'Golden Lady' ); hand-pollinated; seed taken 1996. Named by Barry Sellers; from “lusi-” and “-gena”. ® E.2009:03 registered on 17 August 2009 by Barry Sellers, Norbury London, UK.